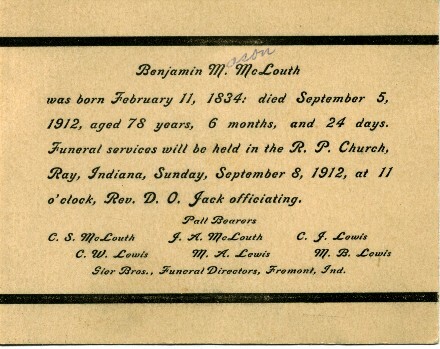 Born February 11, 1834, died September 5, 1912, aged 78 years, 6 months and 24 days. Funeral services held in the R.P. Church, Ray, Indiana, Sunday, September 8, 1912, at 11 o'clock, Rev. D.O. Jack officiating. Paul bearers: C.C. Mc Louth; J.A. McLouth; C.J. Lewis; C.W. Lewis; M.A. Lewis; M.B. Lewis. Gier Bros., Funeral Directors, Fremont, Indiana.